Manifestos published by the main political parties in the UK continue to support the programme of network capacity enhancement and electrification that is planned during Control Period 5 (a 5-year plan between 2014-19). For customers, each party has also given a commitment to move away from the policy of increasing controlled fares such as season tickets by 1% annually above the level of inflation. 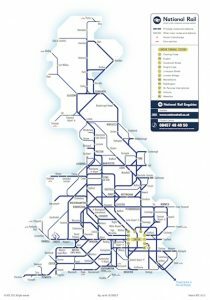 This has been in force since 2004 and has resulted in the fare box now covering 68% of industry costs compared to a little over 50% when the policy was instituted. This was not regarded as particularly contentious in the period prior to the economic collapse in 2008 as take home pay in the UK was rising at an average of 2% above annual inflation suggesting there was headroom for an increase in fares that were seen as affordable. A very different scenario has played out since 2008 with wages falling as compared to inflation and as a result the continuing increase in rail fares had become unaffordable. The Government had intended to increase ticket prices by RPI+3% in 2013 and 2014 to allow fare box income to move closer to covering 75% of industry costs but this was scaled back to RPI+1% and to the level of RPI alone in 2015 – a figure of 2.2%. If re-elected, the current Government intends to continue at the level of RPI alone during the next 5-year Parliament and remove the flexibility train operators have to vary fares on a route by route basis within the overall fares basket. In practice with UK inflation currently in minus territory, this may mean a reduction. The Labour Party offer is a freeze on fares for one year in 2016 and thereafter a similar control of the fares basket to prevent above average increases on selected routes. There is also a specific commitment to require the cheapest ticket for the intended journey to be offered. This is something the industry has found difficult to deliver due to the complexity of fares and the inability of ticket vending machines to provide information on the restrictions that apply for the use of reduced price products. Otherwise each party adopts the theme of the importance of transport and the railways in supporting economic growth in all regions of the country. There is the intention to devolve decision making powers to major cities such as Manchester. HS2 continues to receive support with a promised evaluation of the benefits of extending the route to Scotland to which the Scottish National Party is committed. A change in Government is likely to lead to a new review of the franchising system one aim being to allow a publicly owned train operator to bid and the creation of some form of National Rail body to act as the industry’s guiding mind which is currently the role of the Rail Development Group set up as a result of the McNulty “Rail Value for Money Report” in 2011.